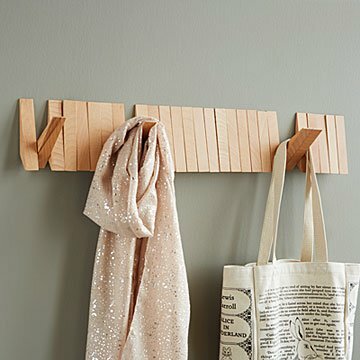 This stylish wooden coat rack has hooks that pivot out only when you need them. Home isn't just where you hang your hat—it's where you wow guests with this ingeniously stylish coat rack. It's made from 25 beechwood triangles that individually tip down to become hooks for coats, hats, and scarves when you need them, and flip back up and out of the way when you don't. The natural warmth of the wood and the secure, hidden mounting hardware make this rack both practical and beautiful. Made in China. Avik Maitra’s background is in product design while Rich Moore specializes is in graphic design and illustration. The two met in architecture school at Columbia, where they started an ongoing conversation about a wide range of project ideas. Soon after graduation, they moved to Portland, Oregon to focus on projects that combined their passions for graphic design, product design, and architecture. Meet Avik and Rich on our blog. Picture shows light wood it came painted black. I ordered this as a Christmas gift for my mother. For the product itself I would have likely given this 5 stars. It seems very well made and designed. I have no complaints about that. However, I thought I was ordering the attractive light wood colored rack in the pictures. The one that came was painted BLACK. As this will not fit her home it will be getting returned and now I need to find her a different gift. I'm rather disappointed by the difference between what was advertised and what came especially since I can't find that there was an option to pick the color. I bought this for my entry way adjacent to the coat closet. I don't have space in my coat closet for guest coats and also needed something higher to hang my kids' jackets since they are getting taller and the old racks were too short. I needed something that didn't stick out and this is so so perfect!! It lets me hang as many items as I want, looks sleek and minimalistic, doesn't jut out so when I open my coat closet door it doesn't hit this rack. It is just so perfect! I love it and highly recommend it especially for small spaces or hanging multiple items. Installing was a huge pain though since the wooden things kept reclining over and it was hard to keep it all intact, so the handyman wasn't able to install it perfectly in one straight line, but you hardly notice it. I would recommend taping it all while installing just to make it easier. It took my handyman almost an hour just to install even though all it requires are two nails. Other than that, it looks good, accommodates as many items as I want, stays hidden when I want it to, and works perfectly for my Manhattan apartment where space utilization is key. We liked the look of the coat rack but it was hard to get up and the wedges don't line up very well, and they are all a bit misshapen in different ways. The coat rack definitely doesn't look sleek and neat like it does in the photos.